The HLHB system produced two crossovers this week, but none of them turned out to be valid. The first crossover, which luckily turned out to be a fake trend change later on, was invalid because the Stochastic was already in the oversold territory. On the other hand, the second one didn’t meet my 30-pip rule. If I sound like a martian to you, then you should probably take a look at the HLHB‘s system rules so you know what I’m talking about. No valid trade for the week, but that’s okay! 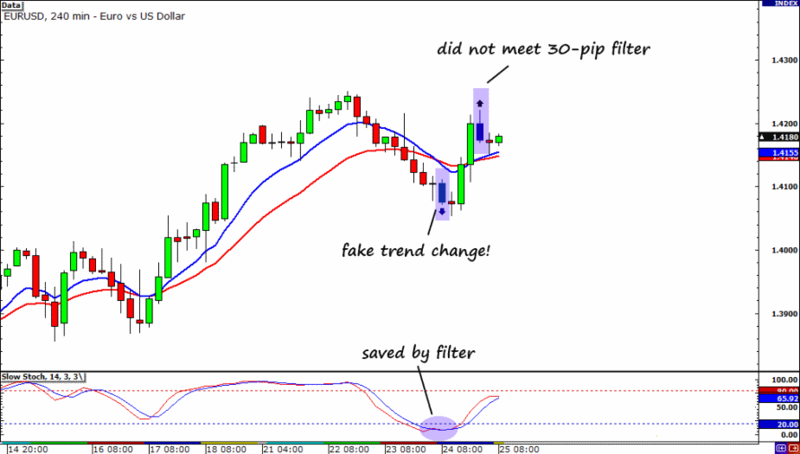 I currently have a positive long EUR/USD trade running thanks to the great advice given to me by my lovely readers in my previous blog post. I know that it still hasn’t hit my profit target, but I’ve already moved my stop to breakeven to make it a risk-free trade! It’s either I come out with a profit or I don’t lose anything at all! Isn’t moving stops great? I have to be honest though, managing my trade hasn’t exactly been as easy breezy as a trip to the salon. Nah-uh! You can imagine bummed out I was when I heard that Jose Socrates resigned as Portugal’s prime minister. I thought I wouldn’t have a trade because this political hulabaloo fueled speculations that a bailout is needed for the debt-ridden country. Fortunately, however, it seems like investors are looking past Europe’s sovereign crisis. Heck! The euro was even able to gain against the dollar yesterday despite Fitch’s move to downgrade Portugal’s credit rating. So what caught the market’s attention this week? It seems like the surge in commodity prices has been the driving force behind the rally in higher-yielding currencies. According to Pip Diddy, heightened inflation pressures could force central banks to hike interest rates. Hopes are especially high for the ECB to start tightening with the hawkish remarks that we’ve heard from some of the members of the bank. Making this even more bullish for EUR/USD is that investors don’t see Fed take part in raising rates anytime soon! But knowing that the market’s mood changes faster than fashion trends, I think we’re going to see a different event dominate the headlines next week. Risks to economic growth? Sovereign debt? Rebecca Black’s acoustic rendition of “Friday”? What do you think will it be? Let me know what your thoughts are. Hit me up on Twitter! Okay, that’s all I have for now. I have to get some sleep so I don’t end up looking like a zombie for my date later. Skadoosh! Enjoy your weekend!